Students take part in a range of integrated activities and are encouraged to improve their performing, composing and listening skills while developing knowledge of musical styles, traditions and cultures. Blues – Students will study the conventions of blues music including improvisation and syncopation. Reggae – Students will perform reggae songs focusing on the social contexts of reggae music as well as working on chord sequences and musical arrangement. Song Writing – Students will study popular song and will compose and record their own songs. 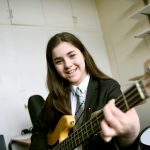 The Edexcel Level 2 BTEC First Certificate in Music consists of two core units, plus one mandatory unit, and three optional specialist units, that provide for a combined total of 240 guided learning hours for the completed qualification.Students will take part in a number of musical activities. They will be involved in performing and creating music from a variety of different musical stimuli. Performance Project – Students will be asked to work on a song of their choice. Recording Project – Students will be working on producing a recording, focusing on the technical aspects of studio work including set up and operation of recording equipment. Unit 4 – Introducing Music Composition – Students will compose music to a number of briefs as if working as a composer.